This page might not be up-to-date (build 921). There are three classes in King Arthur's Gold. You can change your class at a Hall, Ballista, or Warboat by simply holding [E] and releasing over the class change icon, then clicking on the class of your choice. The best place to learn more about class-specific strategies and mechanics is the KAG forum or Steams Guide subsection of KAG. 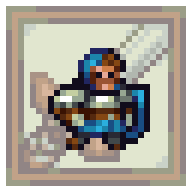 The knight is a melee warrior, that uses a sword and shield to defeat enemies, while protecting himself and others from harm. Equipped with bombs, or any explosives, the knight can be a terrifying enemy. [Right click] - Defend with the shield. Change the shield direction by moving the mouse cursor. It will block sword jabs, builders' pickaxes, all damage from arrows, and all damage from bomb blasts. Enemies can't pass through the shield, but the Knight moves slightly slower and can't jump when he is using his shield. By holding his shield up while midair, the knight can also float gently for a while. Teammates can also step on his upward-facing shield for a jumping boost. [Space] - Perform Action. Use the space bar to light bombs, water bombs, or to light a keg if one is held. Press spacebar again to throw the lit explosive. [F] - Tap to swap explosive types quickly, or hold to open the inventory. [Left click] - Aim, click and hold, release to shoot. The longer you hold LMB, the more powerful the shot will be. Holding the LMB down will eventually lead to an overcharged shot, allowing the archer to shoot three arrows in a spread, like a shotgun (a "Legolas shot"). 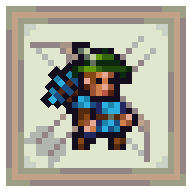 [Right Click (hold)] Will send the archer's grappling hook out, which will latch on to the environment (not players) - Archers can grapple most types of blocks and trees. One can also quickly tap this mouse button as a way of canceling your shot (doing it fast will cause the grappling hook to virtually not appear aka go no where). [S] - The archer drops to the ground making him harder to target for enemy archers; this is also a method to play dead, as enemy players can walk right past him if not paying attention. Note that the crouch feature can be used to avoid stomps and only has an aesthetic feature(Does not change your hitbox). You can also use this feature to hide in tall grass, or behind dead enemies, to allow unsuspecting attacks on enemy players. Beware though, your Gamertag can still be seen from this position if the enemy moves their mouse over you. The minimap may also reveal your position to others. In addition, players can differentiate a prone archer from a corpse by the arrows in their quiver. [W] (on a tree or arrow) - The archer can climb trees to get a better view of the battlefield, hide himself among the foliage, and snipe enemies from a different vantage point. This only last as long as you hold [W] as releasing it will start dropping you down. Archers can also climb fired arrows that are sticking out of the ground (friendly or otherwise - the spent arrow's team does not matter), where after a few uses of climbing on them they'll break. This also works for knights and builders! [F] - Tap to quickly switch between arrow types. Hold to access the inventory and pick the arrow specifically. (Can be combined with shotgun shots for some interesting effects). If you try to shoot a shotgun shot with different arrow types, only the middle one will be the special arrows, the side arrows will be default arrows. The Builder is the backbone of any army. His primary task is to build the infrastructure necessary to protect and mobilize the army. He is able to build ladders, towers made of all sorts of blocks, platforms, spikes and workshops. A builder can mine different types of materials before entering the battlefield, which are used to construct various types of buildings. [Left click] - Build blocks/constructions. To repair damaged structures, left click on the structure using the matching icon. [Right click] - Use your hammer. Cut down trees, mine resources, destroy blocks, and fight. [S] - Ducks, allowing enemies to pass through without colliding. This is useful when a knight tries to shield bash you. [F] - Hold to bring up a menu of blocks to build. 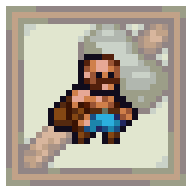 [C] - Pick up/Drop materials, allows you to pick up more material than would normally fit in the inventory. This page was last modified on 28 December 2016, at 21:28. This page has been accessed 97,585 times.